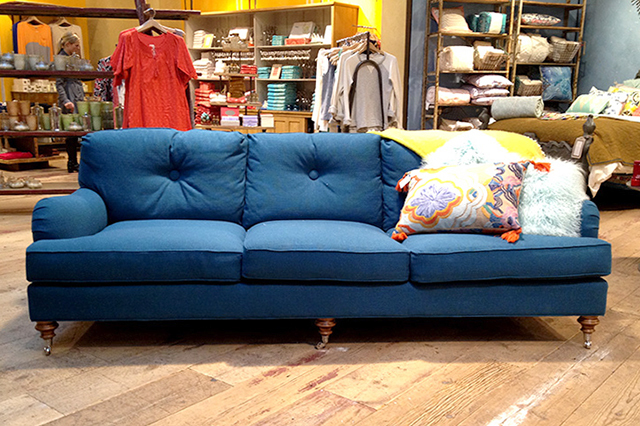 There’s a sofa at Anthropologie that I keep calling the staff to pester about. I’m trying to catch it on sale once they’re ready to let go of the floor model so I can see if just maybe it can come live at our house. It’s big and comfortable and so pretty with its curves and single-button-tufting. And it’s blue. Kind of a teal/turquoise really, but to my surprise, I’m smitten with it. My iPhone pic isn’t doing it justice. OK, so we’re probably not getting it. There are a million other things we could (and should) spend our money on first, but yeah, I’m embracing my newfound love of the color blue. I pinned the image below recently, and I’ve been finding myself going back to look at it over and over again. 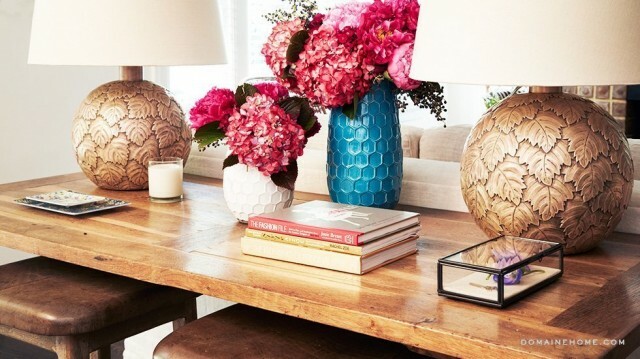 I like the symmetry, the hive vases, and the metal finishes against the wood, but what I’m really drawn to is the contrast of pink and blue. So good! I blame the the upstairs bathroom with its turquoise blue fixtures. Six years of living with them, and the color has charmed me. Yep. I tried to edit it and bring it a little closer to reality, but it was definitely prettier in person. I guess maybe I’ve been in NYC too long, but the only thing that comes to mind when I think about bringing a floor model piece of upholstered furniture into my home is: bedbugs! The stores in Manhattan are seriously crawling with them, it is becoming a real problem. But it is a lovely sofa…and looks comfy, too. Ack! I associate bedbugs with coming from people’s homes/apartments and didn’t even think about the possibility of getting them from a store piece! I like getting floor models because they’re typically at least 35-50% off. Our white Petrie chair and ottoman in the library were floor models from Crate & Barrel, my old orange and white Astrid chair from Anthropologie was one, and the crazy floral armchair I replaced it with was a floor model from Anthropologie too, further discounted because of a tear in the upholstery (which I patched). Our TV stand was a floor model too, from west elm. I’ve always had good luck with being patient and able to get the furniture I wanted at a lower price. Now you have me feeling nervous about doing it in the future with upholstered goods. Sorry, didn’t mean to be the buzzkill! I think it is a bigger problem in NYC — every few weeks or so it seems you hear about another store being closed due to a bedbug infestation. Floor samples do seem like a pretty awesome way to score a deal, and chances are that sofa is totally fine. I dealt with a bedbug problem years ago (hence my hyper-awareness), and I remember the exterminator I worked with said they would come out and preventatively treat a piece of furniture for about $75. I would probably do that if I wanted to buy an antique or something major from Craigslist here in NYC. wow so what is your secret for getting floor models? Just call a lot? Some have been lucky finds that I pounced on (the TV stand and the Petrie set). I asked about buying the Astrid chair directly from the store, and I lucked out that they were ready to get rid of it. That one was the least discounted though, and mostly I just saved on the $250 delivery fee. The floral chair, I’d been wanting for a little while after spotting it in the store. I was in there again and noticed a small tear in the upholstery, so I asked if I could buy the floor model at a discount. They sold it for half off, and I bought it on the condition that I could return it if my attempt at repairing it didn’t work. And again, I didn’t have to pay Anthropologie’s $250 furniture delivery fee. I try not to be too annoying, but I also don’t want to miss out on a good deal. I’ll check in every 2 weeks or so if there’s something I’m hoping to grab on sale. It’s a little weirder now that people sometimes recognize me, and I imagine the Anthro shop girls rolling their eyes, going “ugh, it’s that blogger lady again.” I mean, hopefully not! But probably. How amazing is that sofa?! I want one in faux leather. If they even make that…I’m not about to go check. Yes bedbugs are at stores! My BFF works at Nordstrom, a high end dept store, and they have had bedbugs! Ick! Ooo that sofa is SO good. I love it. Keep pestering them. It would totally be worth it. I also love the inspiration picture you put up. The colors and the patterns, oh my! Nicole, your style is impeccable so I’m going to have to trust you on this one. I don’t see the charm at all and I love your living room! Again, I’m sure I’m wrong here but the one tuft looks off to me. I emailed Kathryn to ask her what she thought of it, and she thinks the proportions are off. So it’s not just you. I agree, the single-button is not perfect, but the rest of the couch is pretty great, and it’s just so dang comfortable. :) They seem to be using pillows and throws to their advantage to hide it in the store. Was drawn to that image also when I saw it. Lovely. Love, love, love it! Would look great in a pale room as the bright point of focus! My mother made everything in her house blue. Walls, carpet, counters, curtains all blue. So I can’t say I am a fan of the blue! But I do love the pink flowers! I’m somewhat concerned about the size since it’s both wider and deeper than the Jasper sofa we have now. Yes, it will fit in the space, but like you said, will it work? I think it would, but it’s the kind of thing that you sometimes have to see to be sure of it. I have a decent sense of scale, but I make mistakes sometimes too. I have found myself deeply, deeply drawn to a vivid, cheery blue/teal lately too – in clothing, on my nails, on one wall – definitely in furnishings. I’m sure it means something profound :-D. Time to let my pale green phase go. And I meant to say – very pretty sofa!! Awesome! I have a closer shot of it on Instagram. This couch is AWESOME! Good find! I hope you get it. Any information is appreciated! I feel like floor models might be one of those bargain-hunting secrets that a lot of people don’t know about. That’s a good idea for a post! And actually, I wonder if there’s a better technique that I should be practicing. Maybe I can talk to some store managers and get a little input on how they like to handle floor models, and I can write about my experience too. Next week? That all sounds great! I very much look forward to reading it. I had a sofa very similar custom built a couple years ago. English roll arm, rounded corner radius on end cushion, a tight rolled back, three bottom cushions down stuffed, 8 feet long. Hardwood frame, 8 way hand tied springs, upgraded foam+down fill on cushion, fabric, and upholstery for under $1200. Granted I might be in a cheaper market(Texas), and knew where to go but it is doable for much less+better quality than exorbitant anthro prices. Plus the advantage is you can specify details like scale, arm height, length, mix and match styles, how firmly you want things stuffed. You can even pick your own feet and stain colors. The hardest part is finding good shops to do your work. 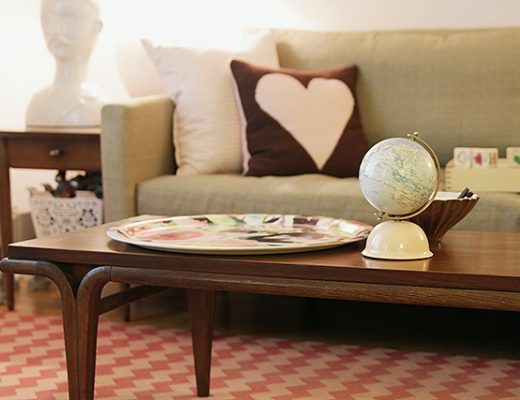 I’m really interested to see if you get it, and how it looks in your pretty home. I have the hardest time decorating with blue, but I bought a teal chair last year, and it is the most complimented item in my entire house. Go figure! Have you seen this sofa? (Actually, the whole line looks great). I did! I wrote up the line on Babble. The sofa’s interesting, but not quite the look I’m hoping for. Woohoo, you are headed to the blue side! The sofa is beautiful. http://www.ballarddesigns.com/eton-sofa/furniture/sofas-loveseats/236136?defattrib=&defattribvalue=&listIndex=40 in blue sunbrella fabric. it’s cheaper and lovely. no pesky buttons, either.